Legend has it that the gods turned animals into stone, or fetishes, to even the odds between stronger animals and weaker humans. It is believed that by wearing this fish you will acquire his power. 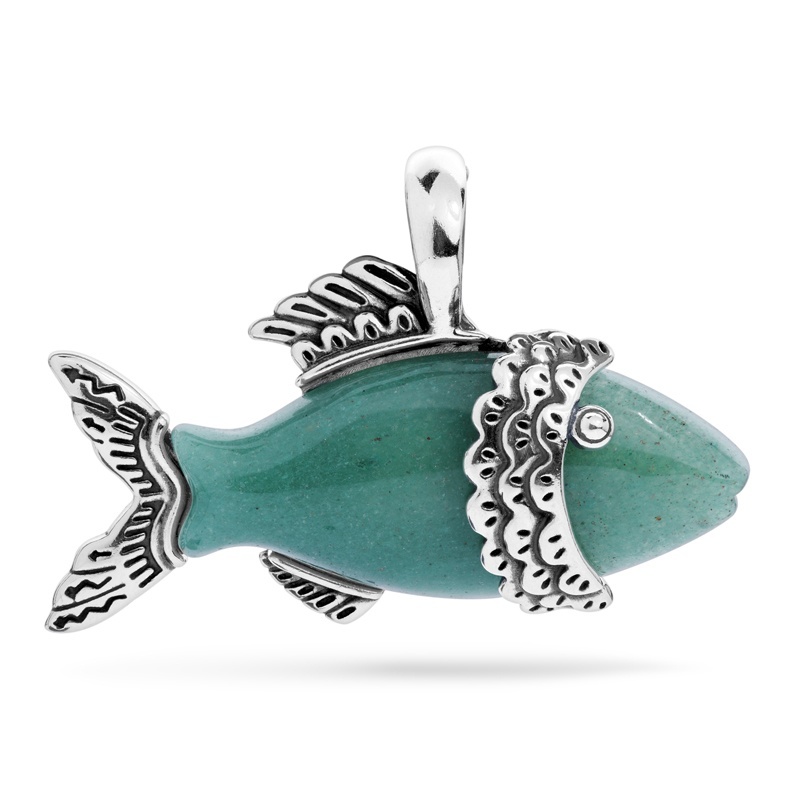 The fish swims the challenging currents of life, adapting to quickly changing emotions. From American West Jewelry. A customer favorite! This beautiful enhancer mesmerizes with its unexpected color and sculptural Sterling Silver overlay. Inspired by the Cascades and the inherent beauty of the Pacific Northwest, a pear-shaped soft white agate cabochon is overlaid with Sterling Silver that flows like the crashing waves of Puget Sound. Green chrysoprase, blue turquoise and purplish-pink phosphosiderite provide pops of color, while the generous enhancer bail provides versatility. Enhancer measures 2" long x 1-1/4" wide. Made in America with gemstones from around the world. The Sea Of Cortez Cuff by US designer, LJD Designs, is a part of the Water Collection, which is inspired by the sea and enchanting water elements. Whimsical in design, the Sea Of Cortez Cuff is a hand forged sterling silver masterpiece suitable for everyday wear. Donning a colour palette of organic shades, the cuff bracelet highlights bezel set Sea of Cortez mabe pearl, chrysophrase cab and gem silica cab and a display of flush set white diamonds, alexandrite, aquamarine and green sapphires.